As the mornings get cooler and the days get shorter this fall here in Athens, Georgia, our tinydawghouse gets a (tiny) bit closer to completion. For now it is just a big, strange, wooden box on a trailer. Our big, strange, wooden box on a trailer! Our tiny house is out growing our tarp! The house just barely fits under the big box elder. This past week was all about getting the loft framed in and the roof rafters up. We chose to go with the simpler design of a shed-style roof that will have metal as the roofing material. I can’t wait to hear the rain on the roof! Now that the roof is on, it is starting to feel a bit more like a tiny house and a bit less like a tiny box! I’m usually not the only one taking pictures on our work days! 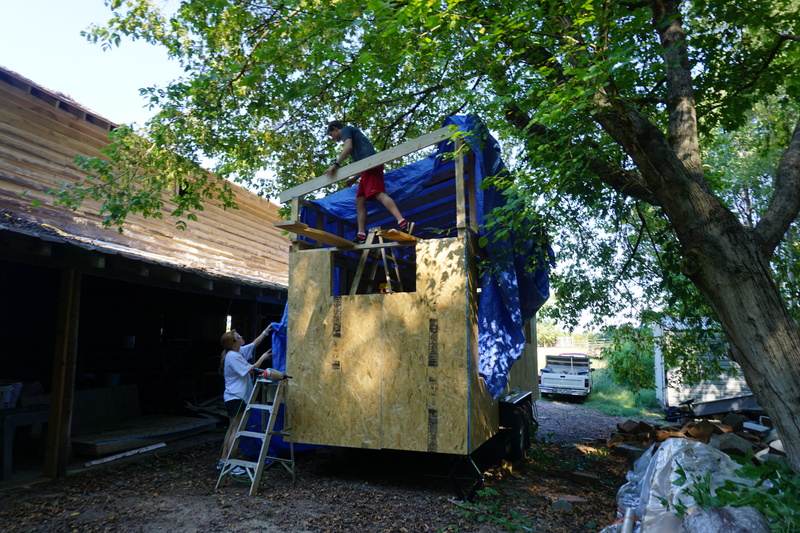 Being as we have this blog to share news on the progress of our tiny house, but not much information on how this whole thing came to be, I am going to try to sort of profile the three people that made this class happen and who are putting in overtime to see that it gets done and is something we can all be proud of. Meet Professor David Berle. Yes Man, Handyman, Plantsman, Teacher. As probably the first professor that I established an an actual relationship with here at UGA, Professor Berle has been a mentor for my studies, my boss, and a source of wisdom for me since I first arrived here two and a half years ago. Berle (as most of his students call him) does so much more than teach for the Horticulture Department here at The University of Georgia. Even though teaching is his only obligation, Berle is also a de facto recruiter, head of UGArden (the University’s organic teaching farm and site of our tiny house build), and unofficial job placement adviser for students about to graduate, among many other things. This tiny house class is the brainchild of both Berle and Dr. Skobba. I first heard about it from Berle about a year ago when it was not much more than a whimsical idea. In less than a year, Professor Berle had written a grant to make this class a reality, stayed up late at night researching floor plans and trailer options, and after working at UGArden with him all summer, when he finally told me that the class was actually happening, I can’t say I was all that surprised…When Berle hatches an idea that he thinks could bring something new and exciting to his students, or be an opportunity for students to learn experientially, more often than not he finds a way to make it happen. Without Professor Berle, our tiny house class would not be a reality. Meet Dr. Kim Skobba. Footprint Conscious, Open-Minded, Societal Norm-Questioning, Professor. As a PHD-professor in the Family and Consumer Sciences Department here at UGA, Dr. Skobba gets the big picture. She knows that it doesn’t make sense to keep building larger homes as the average size of American families decreases. 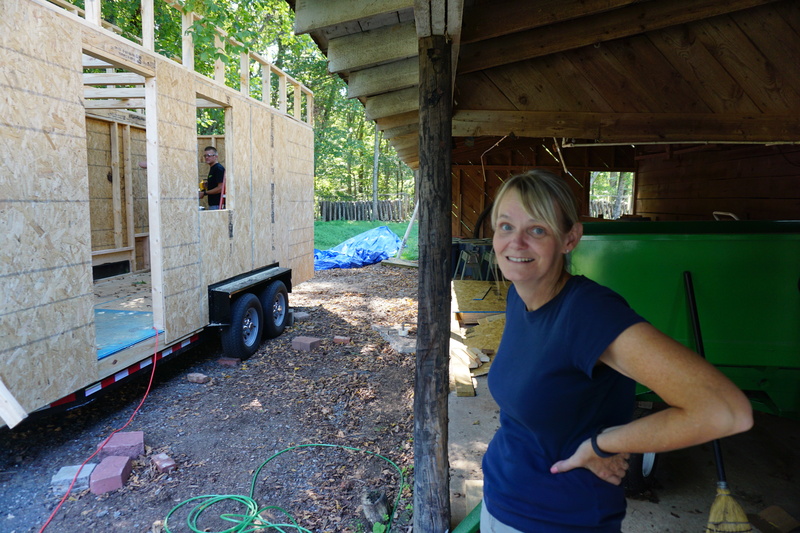 She knows that tiny houses are not only extremely efficient and cost-effective but down-right cool as well. She is a huge fan of trying to utilize space efficiently and minimize space that is unneeded. 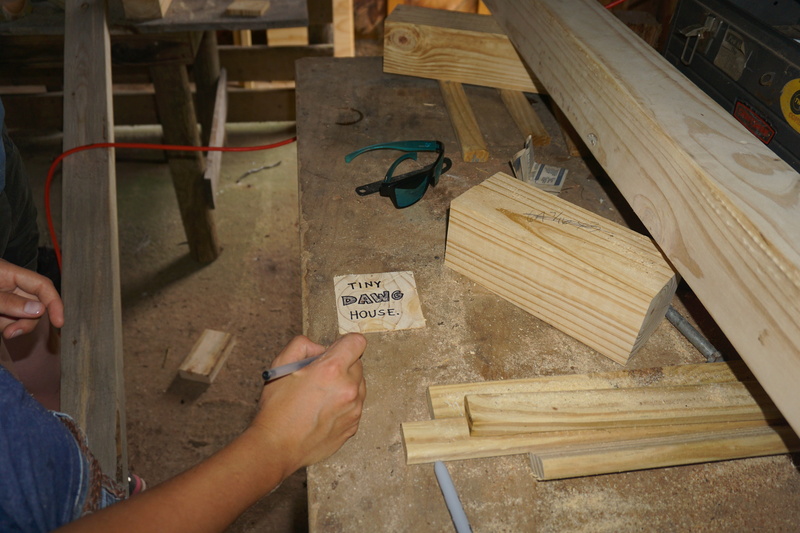 She said last week “I might trade my PHD to have George’s carpentry skills.” It is that type of understanding, hunger for knowledge, and go-getter attitude that is so evident in Dr. Skobba’s character, and is what makes her the perfect discussion leader for the more academic side of our tiny house class. She leads our classroom analysis of why we are choosing to build our tiny house with certain materials, what does it take to be LEED certified, and why tiny living might be at least a partial answer to rising home prices and non-renewable resource waste in the construction industry here in the U.S. It was, after all, Dr. Skobba who hatched the idea of the tiny house class along with professor Berle, and she was undoubtedly just as important in the logistical planning of this class as she is now in the discussion aspect of tiny house class. Meet George Wright. No-Nonsense Carpenter, Patient Teacher, Green Building Advocate, Responsible Contractor. 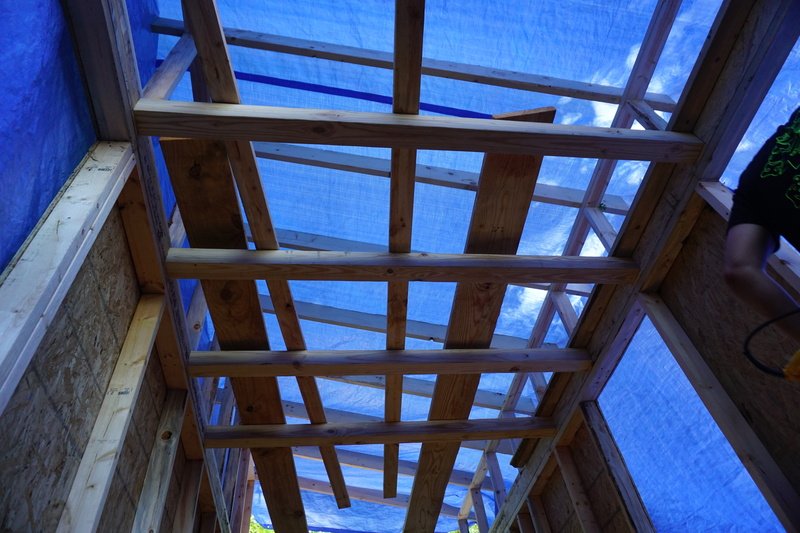 It is safe to say that if George wasn’t overseeing the actual construction of our tiny house, it might fall apart…fast. George brings over 20 years of construction know-how to our class full of total construction amateurs. 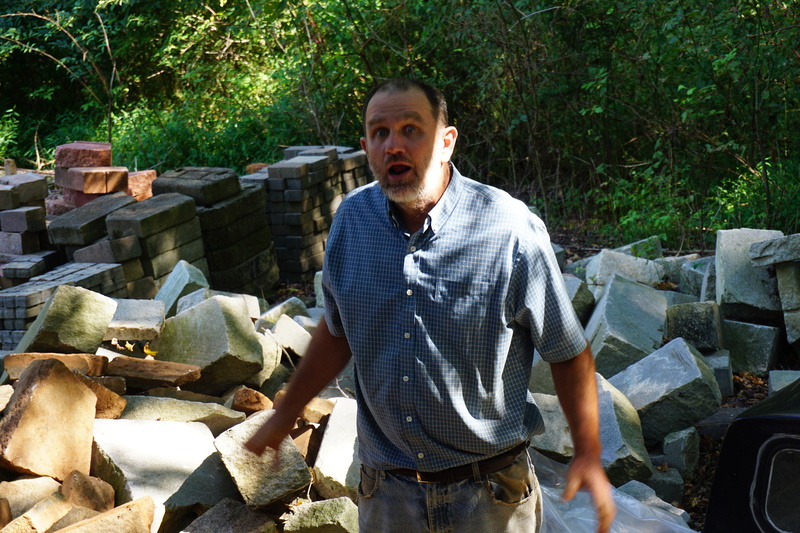 Not your average contractor, George has been making earth-conscious building decisions way before it was cool/hip/trendy. While other contractors were only concerned with profitability, George felt a personal responsibility to make a real effort to reduce waste, use more sustainable materials, and reuse things where possible on his build sites…that commitment to sustainability and more conscious building practices is what makes George the coolest contractor on the block in our eyes. Its also probably why George jumped at the opportunity to work on such a neat project. 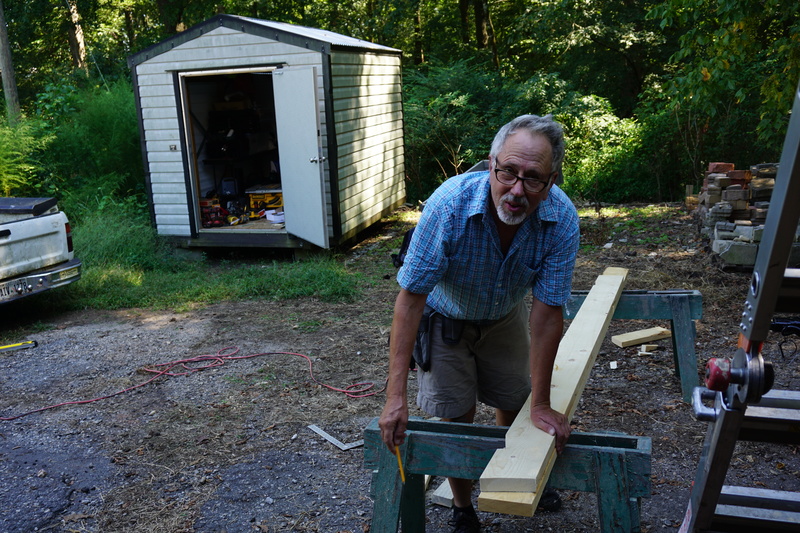 Before we ever started building, George was the practical counter to some of Berle’s lofty ideas for the tiny house, providing crucial insight into how much certain materials would cost, and just what exactly was possible to build within our budget. Now that we are actually building, George and Berle are still making decisions on building materials, floor plan, etc. even at five weeks into the build, but George’s main job is to build this thing! 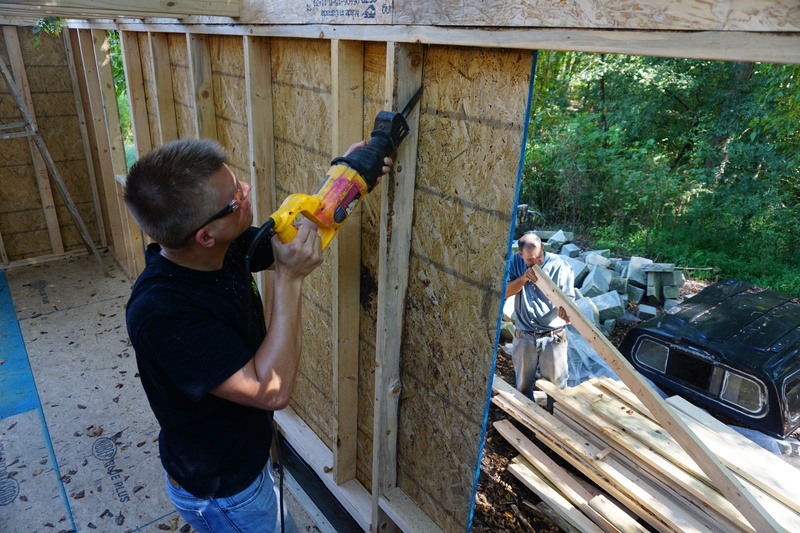 George has a remarkable amount of patience with us as we try to learn how to use the tools properly and work site safety, especially considering he could probably build our tiny house faster by himself than with a crew of four construction noobies there helping him. But George always remains positive and answers any question we ask him, and makes each build day exciting and insightful. Its always no nonsense when we are working on the house, as George is all about efficiency, but I don’t think us worker bees would have it any other way! Each week in this class is something to look forward to. I’ve already said it once on this blog, but I just have to thank these three people mentioned above for making this class a reality. I have a feeling that its something I’ll be telling friends and family about for years to come. Hey everybody, Matt N. here!